BACKGROUND: Inselberg summits adjacent to the Maloti-Drakensberg escarpment occupy an alpine zone within the Drakensberg Alpine Centre (DAC). Inselbergs, the escarpment and surrounding mountains such as Platberg experience a severe climate; inselberg summits are distinct by being protected from human disturbance. OBJECTIVES: The aim of this article was to describe for the first time the flora of inselberg summits and to assess their potential contribution to conservation of DAC plant diversity. METHOD: We investigated whether the flora of inselberg summits formed a representative subset of the DAC flora in terms of shared, especially endemic or near endemic, species and representation of families. All species were listed for six inselbergs between Giant's Castle and Sentinel, located in the Royal Natal National Park (RNNP) during November 2005. Comparisons, using literature, were made with floras of the DAC, as well as Platberg, an inselberg approximately 60 km north from Sentinel in the RNNP. RESULTS: We recorded 200 species of pteridophytes and angiosperms on inselbergs, 114 DAC endemics or near endemics, one possible new species, and several range and altitudinal extensions. Asteraceae, Poaceae and Ericaceae comprised 42.1% of endemic and near endemic species, with Scrophulariaceae and Hyacinthaceae contributing 8.8%. Inselberg and DAC floras differed in respective rankings of Crassulaceae (8th vs. > 15th), Polygalaceae, Apiaceae and Rosaceae (10th, 11th, 12th vs. > 15th), Poaceae (2nd vs. 5th), Cyperaceae (3rd vs. 4th) and Scrophulariaceae (6th vs. 2nd). Growth forms on inselbergs were consistent with DAC flora. Inselbergs shared 40% of species with Platberg. CONCLUSION: Inselbergs, which supported 7.9% of species occurring in the DAC flora, are well protected from human impact, lack alien plants, but, despite this, are highly vulnerable to climate change. Conservation importance of inselbergs will increase as escarpment vegetation becomes increasingly degraded as a consequence of intensifying land use. Montane systems across the globe are characterised by pronounced environmental gradients in relation to altitude and in most cases a unique flora adapted to an extreme high altitude environment (Körner 2003). The uKhahlamba-Drakensberg (hereafter Drakensberg) range is the most conspicuous montane region in southern Africa, rising to over 3000 m above sea level (asl) from plains at about 1200 m asl (Hilliard & Burtt 1987; Killick 1963). Many montane regions consist of a set of relatively separate peaks, whereas the Drakensberg is structured as a dissected plateau bounded by a steep, tall escarpment on the eastern flank (Partridge 1997). This high altitude plateau has been recognised as a centre of plant endemism and a biodiversity hotspot (Cowling & Hilton-Taylor 1997) known as the 'Drakensberg Alpine Centre' (DAC) (Carbutt & Edwards 2004, 2006). Most of the DAC falls within Lesotho although a small portion is situated within South Africa east of the national boundary defined by the summit watershed. The significant biodiversity of the Drakensberg, and specifically of the DAC, contributed to the successful application for the South African portion (plus Sehlabathebe National Park of Lesotho in the southern Drakensberg) to be recognised as a World Heritage site (Krüger & Crowson 2004). Maintaining biodiversity of montane environments poses a significant challenge in the face of global climate change (Körner 2003). Distribution and abundance of most montane plant species is determined by a complex suite of environmental factors for which altitude serves as a surrogate descriptor (Austin, Cunningham & Good 1983). In the Drakensberg, increasing altitude is synonymous with decreasing temperature, as well as increasing precipitation, severity and duration of frost, duration of snow cover, ultraviolet radiation and exposure to extreme winds (Tyson, Preston-Whyte & Schulze 1976). Temperature has a strong and precipitation a lesser influence on plant distribution and diversity within the broader region containing the Drakensberg (Jewitt et al. 2015b, 2016). Environmental domains defined by climate variables within the Drakensberg are projected to alter considerably in response to climate change, specifically an increase in temperature and a consequent decline in water availability because precipitation may not change markedly (Jewitt et al. 2015a). Climate changes of this nature pose an obvious threat to temperate species whose distributions would likely contract into cool refuges. Patterns of land use may pose a greater threat to the maintenance of biodiversity in the short to medium term than the threat posed by climate change. Although the DAC has largely been spared radical transformation such as cultivation or urbanisation, it has become subjected to increasingly heavy use by pastoralists over the past few decades (Quinlan & Morris 1994). Stocking densities are very high compared with the low densities of small-bodied antelope supported by the natural Drakensberg system (Rowe-Rowe & Scotcher 1986). No part of the high altitude plateau escapes the attention of livestock, whose foraging extends to the escarpment edge (Quinlan & Morris 1994). Sustained grazing impacts are expected to result in the loss of a number of species, including endemics, of susceptible growth forms over time (O'Connor et al. 2010; Scott-Shaw & Morris 2015). Environments within the DAC protected from livestock grazing would potentially be especially important for maintaining the plant diversity of this centre of endemism if the main area of the DAC continues to be subjected to severe livestock grazing. Inselbergs (island mountains; Körner 2003) along the eastern flank of the Drakensberg potentially offer such an environment because their high, flat summits are inaccessible to livestock (and most humans), owing to tall cliffs (Armstrong & Brand 2012). Although the flora of the DAC has been relatively well described (Carbutt & Edwards 2004, 2006; Hilliard & Burtt 1987; Killick 1963), to our knowledge the flora of Drakensberg inselbergs had never been sampled before this study was initiated. (Companion papers are Brand, Collins and Du Preez  and Armstrong & Brand .) A general aim of this study was therefore to establish whether inselbergs supported a representative sample of DAC flora in terms of species, genera and families, as well as species of conservation concern including endemic and near endemic species. Inselbergs would not be expected to harbour all DAC species on account of their small size and uniform topography relative to the large escarpment plateau, that is, an island biogeographic effect. In addition, tall cliffs should constrain dispersal even for wind-dispersed species. Inselbergs may therefore not be as exposed as the main Drakensberg to the threat of alien invasive plants (Carbutt 2012). Although the climate of Drakensberg inselbergs has never been recorded, it probably differs from that of surrounding areas, which could further constrain opportunities or alternatively provide different environmental domains to those found within the DAC. 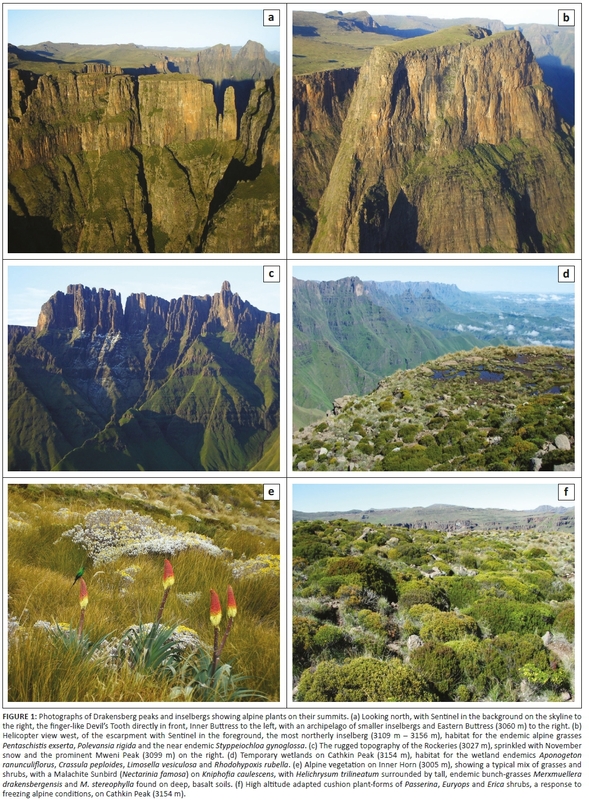 Within the context of assessing the conservation importance of Drakensberg inselbergs, the main aim of this study was to provide a first description of their plants. Specific objectives were (1) to provide an inventory of the plant richness of inselbergs in terms of species, genera and families, (2) to determine whether richness at any of these levels was equivalent to that of the escarpment portion of the DAC, (3) to examine specifically the difference between inselbergs and the escarpment in terms of invasive alien plants, endemics and near endemic species and (4) to identify which growth forms were apparently well adapted to the inselberg summit environment. The study area is described in detail in a companion paper dealing with the phytosociology of the same inselberg summits (Brand et al. 2015). Consequently, only a brief summary of salient environmental features is given here. Basaltic lava flows up to 1370 m in thickness were emplaced about 183 million years ago (mya) with the commencement of the Gondwana break-up, subsequently shaped by erosion during the late Cretaceous period (~65 mya) to form an escarpment marked by cliffs and an associated archipelago of sheer inselberg outliers, each with a summit that is mostly flat (Brand et al. 2015). The escarpment, therefore presumably also the inselbergs, receives > 2000 mm of precipitation per annum mainly during summer (Nel 2007). Climate is quite extreme. Snow falls on average eight times a year during any month but the largest falls occur during winter, frost occurs throughout the year and strong winds may accompany fronts (Tyson et al. 1976). Mean monthly temperature ranges from 4°C to 11°C. May to August are the four coldest months, whose mean monthly minimum temperatures range from -1.0°C to -5.4°C (Schulze 1997). Basalt has weathered to produce soils consisting of a mix of clay, coarse and fine sand, which are dark and high in organic matter (Mucina & Rutherford 2006). Soil depth varies from shallow (< 30 mm) on rock sheets to pockets of > 300 mm depth (Brand et al. 2015). According to international nomenclature (Körner, Paulsen & Spehn 2011), vegetation of the DAC (Carbutt & Edwards 2004) is classified as 'lower alpine' at its upper limit and 'upper montane' at its lower limit. Mucina and Rutherford (2006) identify three units above 1820 m asl in this region, namely uKhahlamba Basalt Grassland (Gd 7) and Lesotho Highland Basalt Grassland (Gd 8) within the upper montane region and Drakensberg Afroalpine Heathland (Gd 10) within the lower alpine region. Brand et al. (2015) identified four main vegetation communities on the six inselberg summits sampled in this study, these being wetland grass and forblands, sheet rock grass and forblands, high altitude alpine grassland, and high altitude alpine fynbos grassland. Wetland vegetation was recorded in semi-permanent pools or on seasonal seeps over sheet rock, gravel beds or soil. Pools contain obligate wetland (OBW) plants (probability in wetlands > 99%) whereas seep habitats support facultative wetland (FACW) (probability in wetlands 67% - 99%) or facultative (FAC) plants (34% - 66% in wetlands), using a classification system for the expected frequency of occurrence in wetlands (Collins 2005; Tiner 1999). An inselberg was suitable if it had a sufficiently large summit plateau for sampling of vegetation. Using topocadastral maps, 11 potential inselbergs spread 60 km from the northern to central Drakensberg, KwaZulu-Natal, were selected, of which the six that could be sampled were the Sentinel, Eastern Buttress, Inner Horn, Outer Horn, Dragon's Back and Cathkin Peak (Brand et al. 2015). Position, elevation and surface area of the sampled inselbergs are presented in Armstrong and Brand (2012). Sampling was undertaken during November 2005. All inselbergs surveyed are relatively flat-topped with the exception of the Sentinel, which has three tiers sloping to the east. Sampling was restricted to summits and covered all habitats. All species occurring within 103 Braun-Blanquet sample plots (Brand et al. 2015) were collected. In addition, thorough ad hoc collections of species not found in these plots were made by R. Scott-Shaw and R. Lechmere-Oertel on all habitats of the inselberg summit (e.g. ridges, rocky terrain, wetland seeps, gravel plains and open grasslands). Nomenclature of species is presented in Appendix 1. Voucher plant specimens were prepared according to standard practices (Alexiades 1996). Initial field identifications were confirmed using the Donald Killick Herbarium (CPF) at Ezemvelo KZN Wildlife, the Geo Potts Herbarium (BLFU) at the University of the Free State, and the National Herbarium (PRE) of the South African National Biodiversity Institute (SANBI) in Pretoria. Voucher specimens (172) were housed at the CPF. A species list was compiled and arranged according to the Englerian system (SANBI, Pretoria). Nomenclature follows Fish et al. (2015) for grasses and Germishuizen et al. (2006) for the remainder modified following consultation with the September 2018 SANBI web database (SANBI/POSA BHRAMS; http://posa.sanbi.org/sanbi/Explore). Red Data species were checked in September 2018 using a SANBI website (http://www.redlist.sanbi.org). Information on endemic or near endemic status (defined according to Carbutt & Edwards ) and distribution, including elevation range, was obtained from published sources (Carbutt & Edwards 2004, 2006; Germishuizen et al. 2006; Pooley 2003; Raimondo et al. 2009; Scott-Shaw 1999). Growth form was assessed using six relevant categories of Körner's (2003) adjusted Raunkiaer classification, namely small phanerophytes (Ph; shrubs < 2 m in height), chamaephytes (Ch; dwarf shrubs, thorny cushions), hemicryptophytes (H; perennial herbs and graminoids), geophytes (G; bulbs, rhizomes or tubers), biennial plants (B; mostly rosette plants) and therophytes (annuals, A). Using these symbols, growth form is indicated in Appendix 1 only at the family level except where species within a family differ. Geophyte status for ferns and Limosella was determined according to Pooley (2003) and Germishuizen et al. (2006). Growth form is considered to be genetically determined (e.g. cushion plants remain so when grown from seed at low altitude), whereas life form represents an interaction between growth form and environment (e.g. shrubs may develop into trees when environmental constraints are removed) (Körner 2003). The potential conservation value of the Drakensberg inselbergs depends in part on whether the flora they harbour is widely distributed or not. We therefore compared their flora with that of the DAC and the Platberg inselberg to the north. On account of the Drakensberg inselbergs forming part of the DAC, it is expected that they should harbour a subset of species, including endemic and near endemic species, occurring within the DAC, which was examined using the study by Carbutt and Edwards (2004). The endemic or near endemic status of plants on Platberg is taken from Brand, Brown and Du Preez (2010). The Platberg inselberg lies 60 km north of the northernmost inselberg sampled in this study (Sentinel); Platberg's flora was described by Brand et al. (2010) and Brand, Brown and Du Preez (2011). The Platberg supports a large plateau (± 3000 ha) of lower altitude (mean elevation of approximately 2390 m asl), otherwise similar climate and geology to the Drakensberg inselbergs, although grasslands are dominated by C4 species, especially Themeda triandra (Brand et al. 2011). A degree of similarity of their floras was expected owing to their proximity and environmental affinities. Vegetation physiognomy showed little change across the 60 km range of inselbergs from the Sentinel to Cathkin Peak. It was a mix of short to medium height graminoids, cushion-forming dwarf or low to medium height shrubs, with herbaceous species interspersed. The rugged terrain, alpine plant species and life forms are shown in Figure 1. A total of 200 species representing 45 families and 91 genera (Table 1) were recorded in a total area surveyed of 31.9 ha; a complete list of species is provided in Appendix 1. Of the 200 species, dicotyledons representing 48 genera constituted 66.1%, monocotyledons representing 37 genera constituted 31.2% and five genera of pteridophytes constituted 2.5%. Of the 114 endemic (61) or near endemic (53) species recorded, 75% represented 14 families, of which 42.1% were in the Asteraceae, Poaceae and Ericaceae families. One is a possible new species (Senecio sp. nov.). Averaged across the total area of the six inselbergs sampled, 3.5 endemic or near endemic species were encountered per hectare of inselberg summit. Table 2 shows the 15 families that contributed the greatest number of species on inselbergs. Asteraceae contributed 27.5% to the total number of species, three times more than the second-ranked Poaceae, the two together contributing 35.5% of the total and 43.8% of the endemic and near endemic species. Other families each contributing at least 5% of the total number of species (≥ 10 species) were Cyperaceae, Ericaceae, Scrophulariaceae, Hyacinthaceae and Iridaceae, totalling 26.5% of the total and 24.6% of endemic and near endemic species. The 61 endemic species belonged to 21 families (6 monocotyledon, 15 dicotyledon), the 53 near endemic species belonged to 20 families (10 monocotyledon, 10 dicotyledon) and the two groups combined belonged in 12 monocotyledon and 19 dicotyledon families. Rank order of the 15 most abundant families for endemic and near endemic species in general mirrored that of their contribution to the total number of species (Table 2). However, families showing a conspicuously high (> 50%) proportion of endemic and near endemic species were the Asphodelaceae, Orchidaceae, Poaceae, Ericaceae, Thymelaeaceae, Scrophulariaceae and Hyacinthaceae. No pteridophyte endemic or near endemic species or any alien plant species were found on any peak. Red Data status of all except six species was Least Concern, the exceptions being Aponogeton ranunculiflorus (Vulnerable, endemic), Colpodium drakensbergense (Vulnerable, endemic), Helichrysum album (Rare, endemic), Helichrysum pagophilum (Rare, endemic), Muraltia montana (Rare), Berkheya rhapontica (Not Evaluated) and Satyrium longicauda var. jacottetianum (Not Evaluated, near endemic). Accordingly, we place emphasis on endemic and near endemic species for consideration of conservation importance. Composition of the inselberg flora in terms of growth form is summarised in Table 3. The majority of species were dicotyledenous chamaephytes contributing threefold more species than geophytes. Chamaephytes were made up of dwarf shrubs, herbaceous and filiform forbs. All non-graminoid monocotyledons, representing 10 families, and all four families of pteridophytes were geophytes. Conspicuous within the rich geophyte vegetation (12 genera, 34 species) were the families Hyacinthaceae and Iridaceae, which contributed 28.8% of monocotyledons and 9% of total inselberg plant species. Orchidaceae, represented by three genera and three species, were not as conspicuous on inselbergs as they are in the broader DAC flora (Table 2). Orchid plants occurred singly at low density. Hemicryptophytes were all graminoid monocotyledons. All 16 grass species (Appendix 1) were perennial, tufted species, and all except Eragrostis caesia and Polevansia ridiga use the C3 photosynthetic pathway. The two exceptions use the C4 pathway. No Themeda triandra, the most abundant species below 2900 m asl across the Drakensberg, was found. Phanerophytes, about 2 m tall shrubs, were represented by four species, mostly Helichrysum trilineatum, with lesser amounts of Cliffortia nitidula, Passerina montana and Passerina drakensbergensis. No therophytes were found. Distinct wetland vegetation associated with numerous seasonal pools and seeps supported a number of endemic or near endemic species of OBW, FACW or FAC plant species (Appendix 1). Hydrophytes endemic to the DAC included Aponogeton ranunculiflorus and Limosella vesiculosa, near endemics included Crassula gemmifera and Limosella grandiflora, while Aponogeton junceus and Potamogeton thunbergii were widespread. Facultative wetland and FAC plants associated with seeps included Aster erucifolius, Crassula dependens, Psammotropha obtusa, the DAC endemic Rhodohypoxis rubella and the wide-ranging Rhodohypoxis baurii var. baurii. Facultative plants associated with wetland communities included three DAC near endemic taxa, the geophytes Wurmbea elatior and Dierama robustum, and the biennial, caespitose grass Pentaschistis airoides. 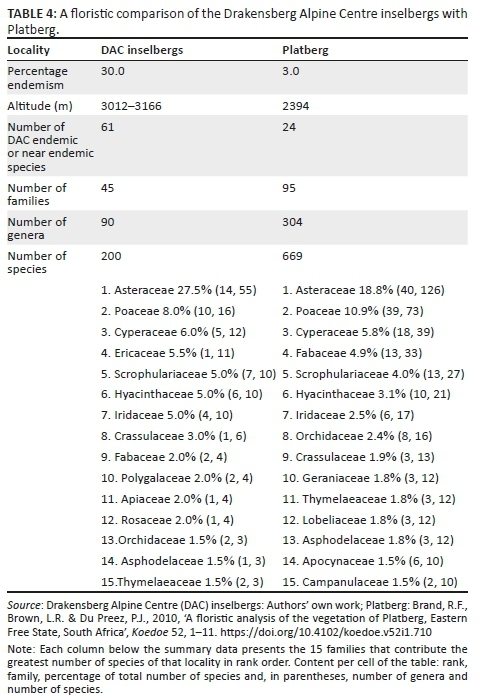 The inselberg flora of 200 species was not a simple subset of the DAC flora of 2520 species as seen by differences in the rank order of families by number of species (Table 2). Although Asteraceae was the dominant family of both, Scrophulariaceae and Iridaceae within the DAC were replaced by Poaceae and Cyperaceae on inselbergs as the second and third most dominant families; some families such as Apocynaceae and Lamiaceae were absent from inselbergs but were conspicuous in the DAC, whereas Crassulaceae, Polygalaceae, Apiaceae and Rosaceae were more conspicuous on inselbergs than in the DAC. At the genus level, the endemic Polevansia (Poaceae), Dracomonticola (Orchidaceae) and Glumicalyx (Scrophulariaceae) occurred on inselbergs and within the DAC, whereas Heteromma (Asteraceae) and Strobilopsis (Scrophulariaceae) were not recorded on inselbergs. The near endemic genera Craterocapsa (Campanulaceae), Guthriea (Achariaceae) and Rhodohypoxis (Hypoxidaceae) occurred on inselbergs and within the DAC, whereas Glekia (Scrophulariaceae), Huttonaea (Orchidaceae) and Thamnocalamus (Poaceae) occur in the DAC but were not found on inselbergs. Comparing the 61 endemic species recorded on inselbergs (Appendix 1) with a list for the DAC (Carbutt & Edwards 2006) reveals that Aponogeton ranunculiflorus, Senecio cristimontanus, Senecio parentalis and Senecio sp. nov. (Scott-Shaw C.R., Brand R., Lechmere-Oertel R., 14363 (CPF)) are 4 of 47 DAC species identified as possibly holo-endemic (a species known from only one or a few highly localised sites; Carbutt and Edwards 2006:108). Of the 61 endemic and 53 near endemic species recorded on inselbergs, Helichrysum (Asteraceae) contained the highest number of all 91 genera with 8 endemic, 11 near endemic and only 3 widespread species. Respective numbers of endemic or near endemic species for other genera were 6 and 2 of 11 Erica species (Ericaceae), 1 and 1 of 4 Cliffortia species (Rosaceae), 1 endemic of 2 Passerina shrub species (Thymelaeaceae), 1 near endemic of 2 Macowania shrub species (Asteraceae), while both Euryops species (Asteraceae) were endemic. This study recorded a higher maximum elevation than previously recorded (shown in parentheses) for the following DAC endemic or near endemic species: Cliffortia filicaulis (1586 m), Helichrysum albanense (1675 m), Helichrysum cymosum (1200 m), Passerina drakensbergensis (1981 m), Thesium costatum var. juniperinum (1500 m) and Thesium nationae (1350 m). Platberg, with 100-fold greater area than the combined area of six inselberg summits, supported 649 species compared with the 200 species recorded on inselbergs, of which 80 species (40% of the inselberg flora) were shared (Table 4). Representation of families was broadly similar, with Asteraceae, Poaceae and Cyperaceae contributing (in order) the most species at Platberg (35.5%) and on inselbergs (41.5%). Ericaceae were well represented on inselbergs but were less prominent on Platberg, although eight species were supported. Asteraceae, Crassulaceae, Iridaceae and Hyacinthaceae were families better represented on DAC inselbergs than on Platberg, with four of six Crassulaceae species shared with Platberg; the converse pattern shown by the Fabaceae, Lobeliaceae and Campanulaceae. Shared species comprised three ferns, 25 monocotyledons (11 DAC endemic or near endemic), including 6 of 12 Cyperaceae species shared, and 52 dicotyledons (13 DAC endemic or near endemic). Grassland on Platberg was dominated by Themeda triandra, a species not recorded on inselbergs. Inselbergs supported a small proportion of the plant diversity found in the DAC, but they supported a large proportion of high altitude endemic and near endemic species (Table 2). Sampled inselbergs supported significant plant diversity of 200 species on a surface area of only 31.9 hectares, of which 114 were endemic or near endemic. A large number of endemic and near endemic taxa in an alpine environment is usually explained by numerous small-scale microhabitats and a wide range of edaphic conditions created by slope and aspect (Hedberg, 1955, 1964; Körner 2003), although the level summits of most Drakensberg inselbergs probably offer less habitat diversity than mountain peaks. Endemic and near endemic species offer a strong focus for conservation owing to their limited ranges, small population sizes and a limited but significant genetic pool (Bangert et al. 2005; Carbutt & Edwards 2006). Assessing the value of inselbergs for conservation of plant diversity depends on the threats and changes inselbergs are likely to face relative to those faced within the DAC on the adjacent escarpment. Inselbergs and the escarpment portion of the DAC differ markedly in terms of exposure to the threats of land use, climate change, alien vegetation and resource extraction by humans. Sustained, severe grazing by livestock is the most important contemporary threat to DAC flora on the escarpment plateau (Nüsser 2002; Quinlan & Morris 1994), a threat to which inselbergs are unlikely to ever be exposed owing to their inaccessibility. Certain non-graminoid growth forms are vulnerable to local extirpation by sustained livestock grazing (O'Connor et al. 2010; Scott-Shaw & Morris 2015), an impact that is possibly occurring on the escarpment. It is not known if sustained grazing on the escarpment has altered fire-return interval; grazing may have promoted grasses at the expense of shrubs, hence increasing the likelihood of burning, or it may have decreased this likelihood through reducing fuel load. The current healthy representation of heath-like elements on inselbergs is, however, evidence of relatively long fire-return intervals compared with other Drakensberg grasslands (De Villiers & O'Connor 2011; Killick 1963). Alien plants pose an increasing threat to the main DAC system, in which 166 taxa, or 6% of its total angiosperm flora, has been recorded as alien (Carbutt 2012; Carbutt & Edwards 2004). In contrast, aliens were absent from inselbergs, a fact attributed to their extreme climate and isolation that restricts arrival of plant propagules associated with humans and livestock, or from natural means. Inaccessibility of inselbergs protects them from harvesting of plants for medicinal purposes, a practice resulting in a substantial local loss of species elsewhere in KwaZulu-Natal (Scott-Shaw 1999). Inselbergs are therefore spared three threats facing the DAC, namely livestock, alien plants and harvesting, all threats set to continue if not increase within the DAC. Inselbergs may contain only a small proportion of DAC flora but they afford this flora strong protection. Climate change is an impending threat against which inselbergs are poorly protected compared with the escarpment owing to differences in topography. Changes in temperature regime are expected to exert a strong impact on plant distribution in the general region (Jewitt et al. 2015a). Specifically, current altitudinal distribution of C3 and C4 grasses in the Drakensberg appears to be strongly controlled by temperature (Bentley & O'Connor 2018; Morris 2017), with a transition from C4 to C3 grasses at an altitude of approximately 200 m below the average altitude of inselberg summits (Morris 2017; Morris, Tainton & Boleme 1993). An expected altitudinal increase of C4 grasses in response to temperature increases resulting from climate change (Stock, Chuba & Verboom 2004) might displace C3 grasses from inselberg summits, as they have no opportunity for contraction into an elevation refuge or aspect-related topographic refuge owing to the flat-topped nature of inselbergs (Sentinel excluded). In contrast, such opportunities for range adaptation exist on the main escarpment for C3 grasses and other temperature-sensitive species. A first threat is that all except two of the 16 grasses sampled are C3 species; representation of this key group may therefore decrease with a consequent reduction of endemic or near endemic grasses, three of which are represented by monotypic genera. On account of C3 grasses currently providing a matrix for inselberg vegetation, a novel threat might arise if these grasses were to be replaced as this would probably considerably alter matrix structure. This threat would be acute if a novel matrix created an inappropriate or poor environment for other species, especially considering a large proportion of these are endemic and near endemic species that generally display a narrow environmental distribution. Uncertainty exists about likely changes in rainfall of this region resulting from climate change (Engelbrecht, McGregor & Engelbrecht 2009), but if the region became drier perhaps the most conspicuous threat would be to the hydrophilic flora, including endemic and near endemic species, found in pools and seeps because desiccation would become commonplace. The potential contribution of Drakensberg inselbergs to conservation of DAC flora will be aided to some degree by other nearby inselbergs such as Platberg. 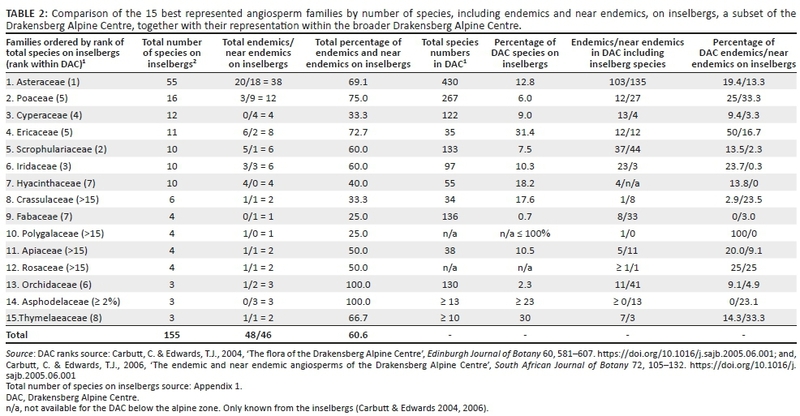 Although 60 km distant, at lower elevation and with differing vegetation, Platberg nonetheless shared a proportion of Drakensberg inselberg species (Table 4) including 24 DAC endemic and near endemic species, illustrating that some DAC endemics may be more widespread than currently known (Table 4). A number of such inselbergs exist within the KwaZulu-Natal lowlands, eastern Free State and extending north archipelago-like along the main escarpment forming connections with Afro-alpine vegetation to the north (Carbutt & Edwards 2001; White 1983). Phytogeographic affinities also extend to the south into the Cape Floristic Region (Goldblatt & Manning 2000) via the Sneeuberg (Clark, Barker & Mucina 2009) and Zuurberg (Carbutt & Edwards 2001; Van Wyk et al. 1988), as well as into the interior Hantam-Roggeveldberge and Nuweveldberge (Clark et al. 2011a, 2011b). Notwithstanding that comparison among these would be compounded by the response of temperature to the combined effects of altitude and latitude, a spatially explicit assessment of phytogeographic affinities between the DAC and its inselbergs with these other montane regions, especially surrounding inselbergs similar to Platberg, would provide a broad geographic context for working toward conservation of the Drakensberg hotspot and centre of endemism of plant diversity. Inselbergs supported a preponderance of chamaephytes, geophytes and hemicryptophytes, a paucity of phanerophytes, while therophytes were absent (Table 3), showcasing growth forms well or not adapted for this high altitude environment (Gröger & Barthlott 1996; Körner 2003; Parmentier et al. 2006; Wesche, Miehe & Kaepell 2008) that experiences severe temperatures, freezing conditions, desiccation including through freezing, and high wind speeds (Tyson et al. 1976). The common forms observed of dwarf and sclerophyllous shrubs, cushion plants, caespitose graminoids with filiform xeromorphic leaves and acaulescent rosette plants (Appendix 1) are characteristic of alpine regions (Körner 2003; White 1983). By contrast, geophytes below-ground bulbs ensure protection in fire-prone grasslands and high altitude alpine conditions of freezing temperatures and heave soils (Mucina & Rutherford 2006). However, fire does occasionally penetrate inselbergs, as revealed by burned Helichrysum trilineatum shrubs (R. Brand pers. obs., November 2005). Plant growth form and vegetation structure of alpine regions is commonly ascribed to the temperature regime of the coldest period (Hedberg 1970; Körner 2003; Körner et al. 2011). A consequent explanation for the dominance of chamaephytes and hemicryptophytes (Table 3) is the extent to which their growth forms enable decoupling of a plant's climate from the ambient climate through increasing heat accumulation in the leaf canopy (Körner 2003) that allows physiological processes to proceed when ambient temperature may be at or below freezing for extended periods (Wesche et al. 2008). An apparent contradiction is provided by the large number of non-graminoid monocotyledon genera with relatively large, semi-succulent, water-rich leaves (e.g. Agapanthus, Albuca, Eucomis, Gladiolus, Hesperantha, Kniphofia, Ledebouria and Moraea) recorded on inselbergs; however, these long-lived perennial geophytes are in leaf only during the warmer summer season. Leaves, stems and flowers die after summer, leaving no visible, above-ground trace, while the bulbs are protected below ground from freezing, desiccation and heave soils (Wesche et al. 2008). Growth habit contributes to graminoid species meeting the demands of a high altitude climate (Gibbs-Russell et al. 1991; Körner 2003). Most graminoid species recorded possessed a caespitose growth form (Appendix 1), which not only protects meristems against fire or herbivory (Briske & Richards 1995) but also confers a temperature advantage to a plant. Thermal advantages also accrue to graminoids with a cushion form (e.g. Pentaschistis spp. ), rhizomatous species (e.g. Koeleria capensis and, Festuca spp. ), species with a combination of a decumbent growth form, rhizomes and stolons (e.g. Colpodium, Polevansia) and even to loosely tufted stoloniferous species (e.g. Karroochloa, Schoenoxiphium and Scirpus). Graminoids, especially caespitose forms, therefore appear well adapted to the climate challenge of this high altitude environment. Furthermore, nearly all graminoid species possessed a C3 photosynthetic pathway, enabling efficient photosynthesis at the temperatures of high elevation (Pitterman & Sage 2000; Sage 2001, 2004). In correspondence, C4 grasses are dominant on the main escarpment up to 2950 m asl on north and 2750 m asl on south aspects, above which C3 grasses are dominant (Morris 2017; Morris et al. 1993), and altitude exerts a strong influence on the distribution of individual C3 grass species (Bentley & O'Connor 2018). Water balance may become critical for evergreen plants receiving seasonal precipitation, especially as water availability may be further interrupted by soil freezing (Tranquillini 1979). Effective coping strategies for non-deciduous species (84% of those recorded) include succulence owing to water-use efficiency, stomatal control and, for mosses, desiccation tolerance (Körner 2003; Rutherford & Westfall 1994). There is no knowledge about stomatal control within species of this flora. Although succulent species were evident on inselbergs, they contributed only 1.1% of the flora (6 Crassulaceae; 2 Aizoaceae; 2 Euryops; 12 Senecio; Othonna burttii; Psammotropha obtusa). Crassulaceae and Aizoaceae species also benefit through use of the crassulacean acid metabolism (CAM) photosynthetic pathway that is effective at low temperatures (Pitterman & Sage 2000). The conspicuous presence of Crassulaceae species on Drakensberg inselbergs by comparison with the DAC (Table 2) is consistent with a pattern evident for inselbergs in west (Parmentier et al. 2006), central and east Africa (Hauman 1955; Hedberg 1970), suggesting their abundance owes to reduced exposure to fire. Thick roots capable of withstanding the shearing forces exerted by frost heaving of soils (Körner 2003; White 1983) were possessed by Orchidaceae, Apiaceae, many Asteraceae, Brassicaceae, Caryophyllaceae, Fabaceae, Gentianaceae, Scrophulariaceae and the genera Craterocapsa, Cyphia, Epilobium, Geranium, Polygala, Scabiosa and Valeriana. Poor representation of phanerophytes suggests an influence of strong winds (Grace 1977), growth rates inhibited by low temperatures (Tranquillini 1979) or even the inhibiting effect of high ultraviolet radiation on stem extension (Hedberg 1964), ecological factors that have been largely ignored in the Drakensberg. The significance of this study lies in documenting the unique, intact alpine flora found on inselbergs and their value for biodiversity conservation. The majority of the alpine belt of the DAC lies in Lesotho, which has poor rangeland management and only one small protected area. The inselbergs are located in South Africa and are statutorily protected as part of the Maloti-Drakensberg Park World Heritage site. The inselbergs are detached from the main escarpment, which makes them inaccessible to livestock impacts of grazing, trampling and erosion, harvesting and frequent fire. The inselbergs protect a near-pristine flora and provide a benchmark for alpine plants, vegetation and habitat with no evidence of invasive alien plant species. The conservation value of all the inselbergs represents sites of unique potential for future conservation management and assessment of climate change and other anthropogenic transformation. Outside of the Drakensberg, other inselbergs are not yet formally recognised as sites requiring protection under conservation legislation. The Free State Department of Environmental Affairs is currently in the process of including inselbergs in its biodiversity strategy - the first step in providing formal status for statutory conservation management and protection. An integrated national approach toward the protection of inselbergs should be the desired outcome. We thank the Maloti Drakensberg Transfrontier Project staff, especially R. Lechmere-Oertel, for logistical support; J. du Preez and R. Lechmere-Oertel for contributing to the plant collection; and R. Jansen and D. Jewitt for comment on a preliminary draft. R.F.B. was the principal investigator and the first author, obtained the National Geographic Grant, organised the collaborators, field and herbarium collection and identified the plant material. C.R.S.-S. assisted with field identification and collection of plants, herbarium curation, production of vouchers, including the labels. T.G.O. performed extensive revision of the manuscript, the addition of supporting references and critical comments of key concepts including fire, grazing and conservation value of inselberg flora. The fieldwork for the study was funded by the National Geographic Committee for Research and Exploration (grant no. 7920-05). List of species recorded on inselberg summits of the Drakensberg are arranged according to the Englerian system, and includes notes on species distribution, endemic status and specimen details. Nomenclature was checked against the South African National Biodiversity Institute site (http://posa.sanbi.org/sanbi/Explore) during September 2018. Abbreviations for distribution: DAC, Drakensburg Alpine Centre; EMR, Eastern Mountain Region (Pooley 2003, p. 13; synonymous with the DAC); EC, Eastern Cape; KZN, KwaZulu-Natal; L, Lesotho; M, Mpumalanga; N, Namibia; SA, South Africa; alt., altitude; end., endemic; nr-end., near endemic; prev. alt., previous altitude. Growth form is only indicated for a family except where genus or species differ (e.g. Rosaceae: 3 Ch, 1 Ph). Key to growth form: Ch, chamaephytes (dwarf shrubs, thorny cushions, buds close to the ground); G, geophytes (bulbs, rhizomes or tubers, below soil surface); H, hemicryptophytes (perennial herbs and graminoids, buds at the surface of the ground); Ph, phanerophytes (shrubs, 2 m or less). Abbreviations for collectors: B, Brand; L-O, Lechmere-Oertel; S-S, Scott-Shaw. Only plants that were collected and vouchered have a collector's number (e.g. S-S, B & L-O 14237). No vouchers were collected for widespread or common species, which were identified in the field, and accordingly the right-hand column remains blank.